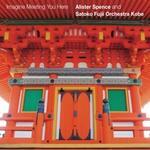 Imagine meeting you here / Alister Spence and Satoko Fujii Orchestra Kobe. A suite in five parts composed for, and intended for realisation by, improvising orchestra. Contents note: 1. Imagine -- 2. Meeting -- 3. You -- 4. Here -- 5. Postscript.